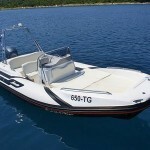 If you require a RIB that provides sense of security and well being, excellent performance, handling and incredible versatility, then there is no better craft than a ZAR 53. 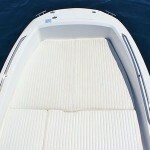 This boat has been designed to look as good as it performs. 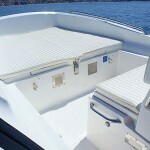 ZAR 53 is very strong and well constructed, it’s made to handle inhospitable conditions.This boat has a comfortable 8 running seats, a double sunbathing bed in the front, 8 peaks to stow goods and a range of unique combinations seats/sun bathing bed/bed/table. 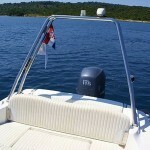 Ideal for the family that can enjoy wonderful autonomous nautical days, this boat is excellent for all purposes. Everything has been planned and built for maximum comfort. The hull is deep and long as much as the one of many bigger boats and offers soft sailing on the waves, stable tacking and agility, all qualities that are unique in its category. 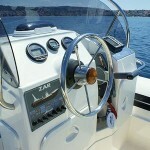 Her elegance and practical design make ZAR 53 a unique boat all over the worldwide. 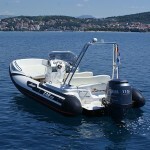 Length 5,53 m-Width 2,39 m-Engine Yamaha 115HP FourStroke-Max. 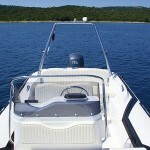 Speed 38 MPH-Fuel Tank 130 l-Fresh water tank 75 l-Persons max.8-Air chambers 6-Year built 2008.